EMC Security is one of the top home and commercial security companies in the state of Georgia. Servicing over 135,000 homes and businesses, EMC has worked hard to earn the trust of its customers. Naturally, we were honored when they asked us to develop their new website. We understood that it needed to match up to the quality of service they provide to their customers every day. Every section of the site was carefully thought out to ensure it would accommodate the wide variety of customers EMC serves. On the home page, users are immediately greeted by a split banner with two distinct paths: Home Security and Commercial Security. Making this the first thing users see allows them to quickly begin viewing the security options that relate to their needs. Scrolling down the page, users are shown the many ways in which EMC goes above and beyond to provide affordable, comprehensive security solutions. On the home security page, users are asked to make a simple choice of whether they currently own a security system or are in need of one. Those needing a security system are taken to a page that presents the various security options and devices EMC offers to help protect their home. With the first section being an interactive home module, users are able to envision what an EMC-powered security system would look like. Scrolling down the page, users are given the option to select if they want to have their security system installed by an EMC professional or install it themselves using one of their self-install kits. Choosing the self-install option allows users to browse the three different kits EMC offers and order it directly from the site. Choosing professional installation shows users the benefits of having a security system installed by a trained professional. For customers who already own a security system and wish to keep it, choosing the “have a system” option offers them information on how to switch to EMC’s alarm monitoring service. For EMC’s business clientele, the commercial security page shows a complete breakdown of the four main security solutions they offer. With a page dedicated to each solution, businesses can learn about the robust list of options EMC offers as well as how each relates to their industry. 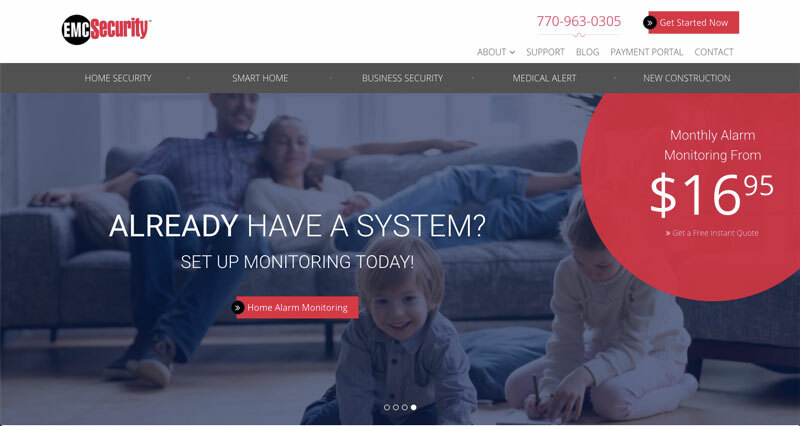 In the end, we were able to deliver EMC a new website with improved functionality that will help expand their clout as one of Georgia’s top security providers.